Successfully Added Symphony - 3G Wireless IP Camera (Ultimate Video Surveillance) to your Shopping Cart. 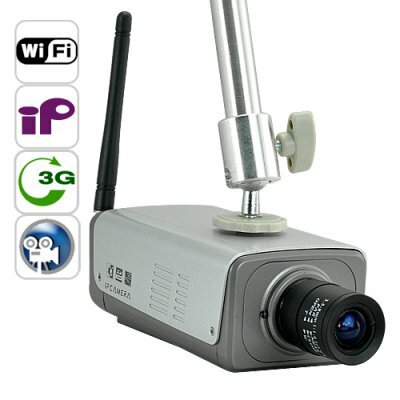 Use this new Wireless IP Camera to enjoy high quality, live video surveillance on your computer, security monitoring station! Thanks to 3G wireless IP technology, the Symphony can be used from anywhere in the world and even includes video recording, night vision, and motion detect alarm - ideal for small businesses and homes. Imagine being able to watch the video feed from your security camera on your computer or calling your security camera from anywhere. Well you don't have to imagine anymore - the future is here! With the Symphony 3G Wireless IP Camera you can see who is asleep and who is working, see if the kids are doing their homework like they should be, see if the girlfriend is wearing those "special" pajamas - directly from your computer. With 3G being available almost anywhere, this Wireless 3G Video Surveillance Camera provides true, real-time mobile security. Anyone can appreciate a cost-effective and high quality device to protect their interests, and the Symphony is ideal for homes, small businesses, restaurants, corporate IT, entry areas of sensitive labs, and many other places. This Wireless 3G Video Surveillance Camera is also especially useful for remote places where there may be a lack of broadband and communication lines as 3G is wireless and ready to go. Using only the best in DSP technology, the Symphony 3G Wireless IP Camera gives you video surveillance that is both convenient and ultra high quality. It is being introduced by Chinavasion at an astonishing low wholesale factory direct price for its world introduction. Click "Add to Cart" right now and we'll express ship you a sample to enjoy it for yourself. Then when you see how outstanding the quality is, feature it on your online store for some easy and high profit sales for your website. 3G Wireless IP Camera - Set your camera up anywhere! Does the Motion detection have an included sensitivity control? Yes, you can control both the sensitivity and adjustable area of motion control, making it a maximum security and maximum convenience camera. This camera is (almost completely) wireless. All you need is a power source.